Martin is a very special friend to us all and an invaluble member of the team. Martin Chadburn has dedicated his spare time to helping transform the lives of armed forces veterans in the Hull and East Yorkshire area. 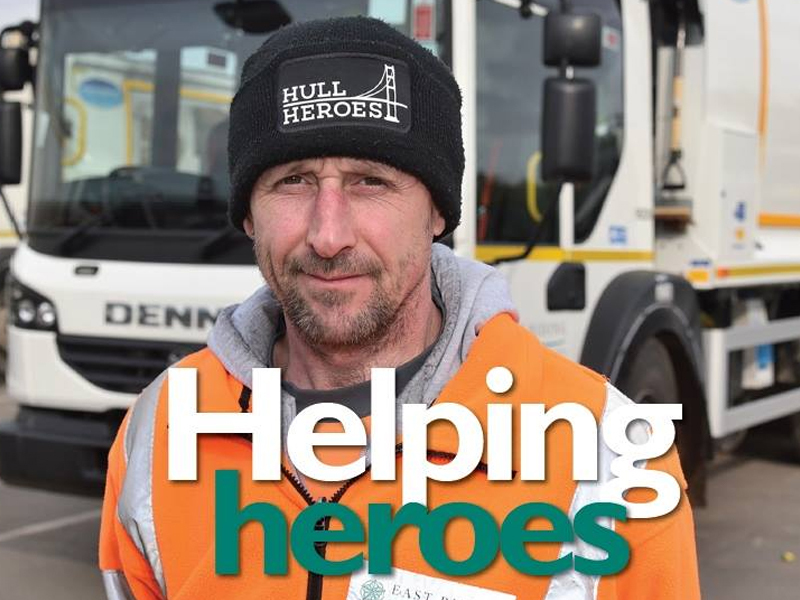 Martin, a refuse lorry driver based at the Willerby Depot, has been heavily involved in the Hull 4 Heroes charity for the past two years. A former soldier himself, he has volunteered many hours of his time – even using his annual leave – to help the charity give much-needed makeovers to the homes of local forces’ veterans who are living with illness or trauma. So far Martin, 45, and a team of 11 other volunteers, have helped with renovation projects on four houses in Hull and Beverley, with materials donated by local tradesmen. He recently helped the team install a walk-in shower for an ex-serviceman suffering from motor neurone disease. Martin, from East Hull, has worked for the council for nine years and is currently on the brown bin collection rounds in the Beverley area. He previously served for nine years in the Army including tours in Northern Ireland and Bosnia. He said: “I’m a forces veteran myself and working with Hull 4 Heroes means I’m giving something back. I feel passionate about that. “When you are an ex-serviceman it’s like a brotherhood. I’d go out of my way to help them. It’s like a family. As part of his work with the charity, Martin even volunteered for the BBC TV show DIY SOS when it transformed disused houses in Manchester into a village for war veterans last year – and got to meet presenter Nick Knowles and team member Billy Byrne. Hull 4 Heroes has its own plans to create a veteran’s village in the Hull and East Riding area, which is something Martin is keen to help with. He has also taken part in fund-raising events with his friends at the charity, including completing a coast-to-coast walk from St Bees to Ravenscar which raised more than £3,000. Paul Matson, the founder of Hull 4 Heroes, said: “Volunteers are crucial for Hull 4 Heroes. Without them we simply couldn’t achieve anywhere near the amount of good work we do. “They are normal people putting their lives on hold to help others. Martin is beyond doubt one of these people. He has a heart as big as the moon. “From the very start Martin has donated his own money, his time and his caring ways to us all. He’s a true gentleman. “So much so that he forced an emergency trustee meeting where each and every one of us voted Martin on to our committee.